17 Designs wrote a custom E-Commerce for Distributors Solution for Adaptall Inc. (using PHP web development with jQuery scripts) that takes into account the specialized requirements of their distributors in filling complex orders and shipping to thousands of different customers across North America. 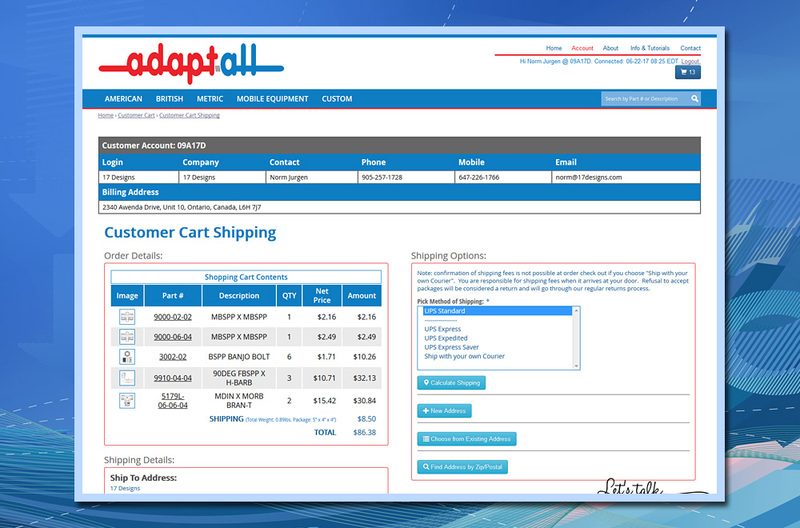 Once a distributor is successfully validated and logged into the Adaptall E-Commerce portal, product stock is instantly accessible and from a simple SKU (product category) listing a distributor may add multiple products to a shopping cart and update quantities. A range of shipping options exists using the UPS Shipping API and a unique feature shows the distributor the weight and shipping container size of any order being placed. Thanks to some uniquely written jQuery scripts, each stage of this E-Commerce for Distributors Solution is well-crafted to create instant screen updates without the need for a screen refresh. 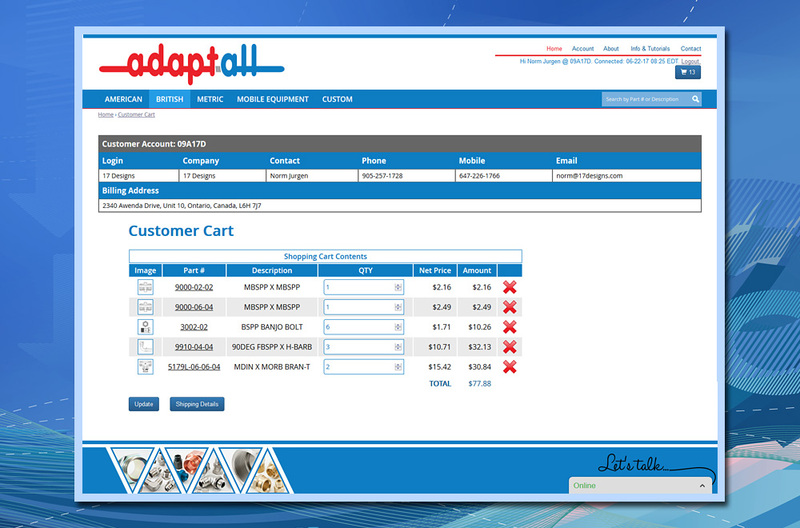 The entire visual is slick, professional and getting rave reviews by Adaptall customers. When product stock is depleted distributors are presented with an option to Inquire. To keep product stock in sync with actual inventory a server cron job updates the MySQL product database every 15 minutes during regular business hours. For management of orders distributors may reference a detailed Account History at any time. In addition, when orders are not completed distributors are prompted to re-activate orders during their next login. 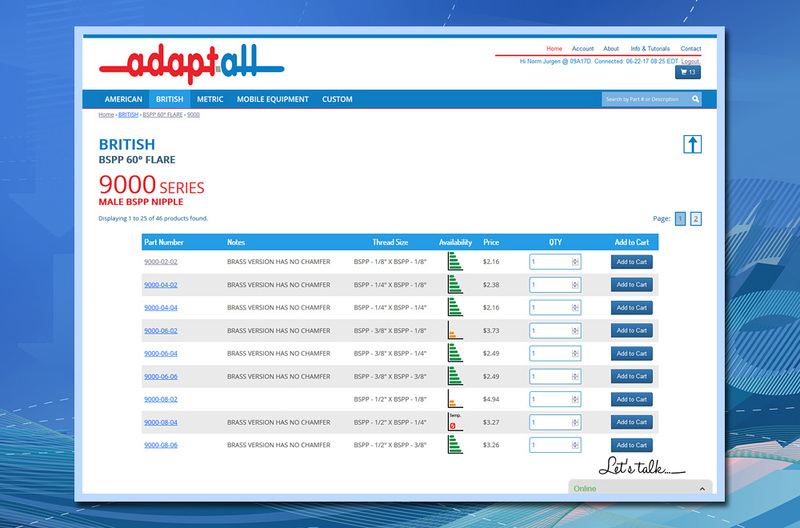 To assist with on-line activity, Adaptall staff may inquire into product views, orders in progress, orders placed, password resets, logins and logoffs. 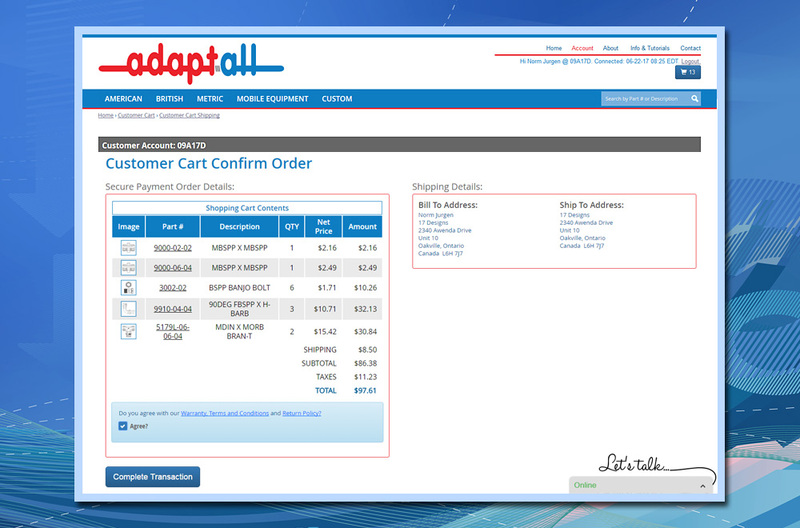 Adaptall can also choose which options a distributor is eligible to pay by: a well-established distributor can pay according to preset terms, whereas a new distributor transaction will be processed and validated by credit card using www.stripe.com. 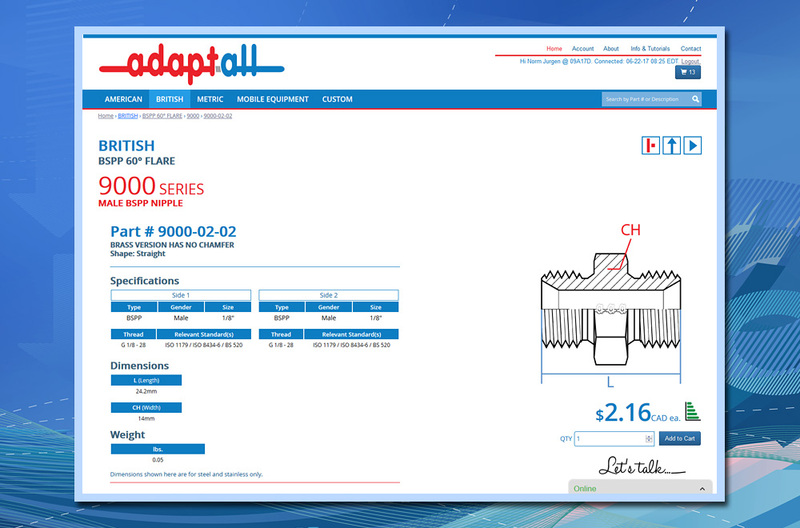 This E-Commerce Solution gives distributors access to the complete Adaptall product line which is over 8,400 products using a fantastic mobile-friendly web interface that 17 Designs was pleased to develop. Contact Us for a demo. E-Commerce Cross-Selling: Would you like to add a component?